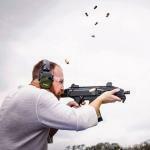 HK MP7A1 Gun in like new condition, around 200rds fired through it. WILL TRANSFER TO YOUR FFL/SOT WITH DEMO LETTER. Will come as pictured with two 40 round HK magazines and M12x1 threaded AAC 51 tooth muzzle device. Also included is 17 boxes (50 rounds each) of Fiocchi 4.6x30mm ammo. $8,000 SHIPPED. Feel free to ask any questions!!!! Listing a LIKE NEW FIX from Q. NO WAITING! IN STOCK ADN READY TO SHIP!!! This thing is sweet! Here are some specs: -ONE-PIECE RECEIVER -45° SHORT THROW BOLT HANDLE -FULLY ADJUSTABLE FOLDING STOCK -FREE FLOAT Q-SERT HANDGUARD -SR-25 MAGAZINE COMPATIBLE -FULL-LENGTH M1913 PICATINNY TOP RAIL -MUZZLE: 5/8-24 Threads, Tapered Muzzle, Cherry Bomb Muzzle Brake -TRIGGER: 2-Stage Match -AR CONTROLS -22" BARREL -WEIGHT: 7.6 lbs -LENGTH (OPEN): 41.1" - 42.6" -LENGTH (FOLDED): 31.9" -BARREL: 1:7 Twist, Medium Palma Profile, Stainless Steel -COLOR: Brown-ish Grey Accents This one has a Trash Panda can as well. Not just any Trash Panda; THIS ONE HAS THE SAME SERIAL AS THE RIFLE!! Here are some specs for the Trash Panda: -CALIBER: 7.62 NATO / 300 BLK / 300 WM -SILENCER WEIGHT: 11.8 oz -MUZZLE BRAKE WEIGHT: 2 oz -DIAMETER: 1.75" -OVERALL LENGTH: 6.9" -ATTACHMENT: Quickie™ Fast-Attach -MATERIAL(S): 100% TITANIUM -FINISH: PVD $3500 SHIPPED. Will sell the rifle separately for $3000 WE EFILE FORM 3's!! !